Yesterday, PlayStation 4 owners were the first to get their hands on Call of Duty: Black Ops 4's Blackout beta. It's Treyarch's new battle royale mode for the upcoming, multiplayer-only first-person shooter, and the response from the community so far has been a resounding "Yes please!" Featuring a large, open map inspired by various locations from Call of Duty's past, 80 players drop from a helicopter squadron to fight to the death in teams of either four, two, or a lonesome one, picking up weapons, armour, ammunition, and gadgets to get the edge over their competitors. 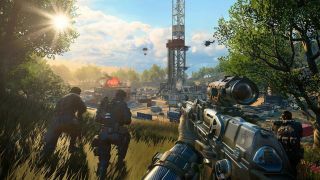 For a beta, Blackout is a surprisingly polished experience, maintaining a consistent framerate and Call of Duty's smooth, shiny visuals across the biggest map the series has ever seen by far. It's still a beta, however, and Treyarch is taking the opportunity to gather as much feedback as it can from the limited test preview to then inform future updates to the PvP mode. Just less than 24 hours since the beta released, in fact, and the studio has already outlined its short term plans on an official Reddit post. So, what's being changed? The Item Pickup mechanic is being sped-up to ensure players don't get bogged down in scavenging, while updates are coming to the Quick Equip menu to improve inventory management in-game. Meanwhile, Treyarch promises it is looking at both the armour systems and friendly fire very closely, as it decides how to bring them in-line with the mode's competitive fairness, though no news as to whether the latter will be turned off for good in future. For now, the studio offers a warning to griefers killing their teammates on purpose: "We’re collecting stats on players who damage their teammates with friendly fire and have a security team monitoring those players for offenses that are outside the bounds of the occasional accident. Play nice out there." Interestingly enough, Fortnite used to have friendly fire on in the early days of its Battle Royale mode, until Epic Games quickly removed it after all the pain it was causing between Squads. I'd imagine Blackout will eventually receive the same treatment. Finally, Treyarch has some tips for those struggling to figure out how wingsuits work in Blackout. The short answer is yes, you can use them anytime during the game, but you need to be dropping from a decent height, before simply holding the sprint button to deploy and start gliding. Now get back in there, soldier.